Are you seeking for deep & soaring melodies? Are you roaming through the cosmos of sound, in search for twinkling stars and beauteous galaxies? Are you a STARSEEKER? 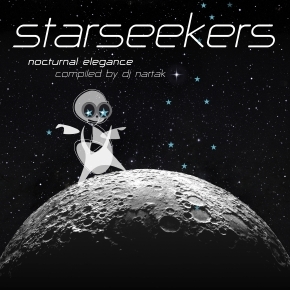 If so, feel invited to discover DJ Nartak’s brand new compilation concept called ‘Starseekers’. Essentially it is a light-hearted blend of modern Downtempo & Listening Electronica. Nocturnal elegance delivered by loads of well-known international artists and promising newcomers. A stunning selection, that weaves a spell around you and whisk you away on a dreamy and inspiring journey, that you wish would go on and on. DJ Nartak is one of Germany’s premier experts, specialized in introspective music across a variety of genres (Ambient, Electronica, Acoustic, Chillout, World Music & more). A sublime DJ, known for his fabulous radio shows called ‘Klassik Lounge’ and ‘Nightflight’ on Klassik Radio Germany, and for numerous, outstanding compilation releases. Once again he has teamed up with his friends at Lemongrassmusic, to develop another deeply moving journey for the electronic music circus. While listening, ‘Starseekers’ enfolds a mesmerizing scent, that will calm your senses and rejuvenate your spirit. Be sure to check this out. Sink into nocturnal elegance.